House Intelligence Chairman Devin Nunes To Step Aside From Russia Probe : The Two-Way Nunes has been accused of improperly disclosing classified information; the House Ethics Committee is opening a review. Nunes will remain as the Intelligence committee's chairman for other matters. House Intelligence Committee Chairman Devin Nunes, R-Calif., walks to the House floor on Capitol Hill last month. On Thursday, Nunes said in a statement that he was temporarily stepping aside from the panel's Russia investigation. House Intelligence Chairman Devin Nunes says he is temporarily stepping aside from the committee's probe into Russian meddling in the 2016 election, as the House Ethics Committee opens an inquiry into whether he improperly disclosed classified information. Nunes will continue to serve as the committee's chairman and remain involved in other matters before the panel. Rep. Mike Conaway, R-Texas, will take the lead on the Russia investigation. Allegations that Nunes mishandled classified information center on a controversial press conference late last month, when he described intelligence that he says showed routine, legal surveillance of foreign individuals accidentally picked up conversations with or about associates of President Trump. After that disclosure, several watchdog and activist organizations filed complaints with the Office of Congressional Ethics asking for an investigation into whether Nunes violated House rules. Nunes calls the accusations against him "entirely false" and said they were filed by "leftwing activist groups." The Office of Congressional Ethics, or OCE, would not comment on whether it was pursing an investigation. But the House Ethics Committee — a more powerful ethics group — said in a statement it was opening a review of Nunes' actions. The committee only considers complaints filed or endorsed by House members and can recommend punishments. The House Ethics Committee did not mention the complaints to the OCE in its statement. Instead, it said it is aware of "public accusations" that Nunes "may have made unauthorized disclosures of classified information, in violation of House Rules, law, regulations, or other standards of conduct." 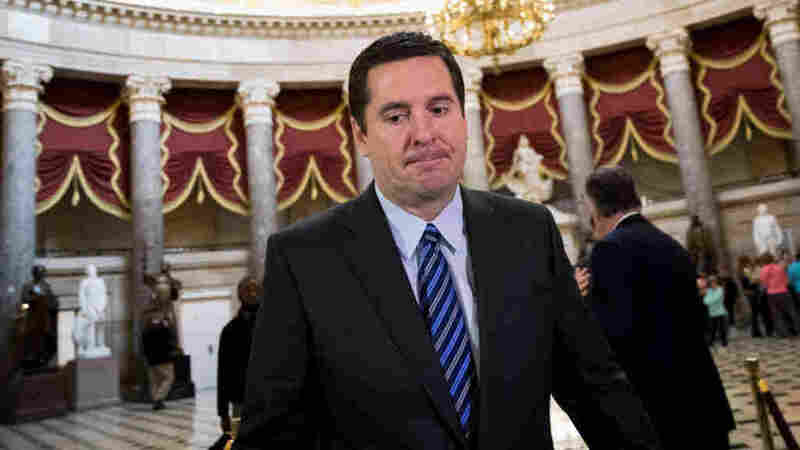 Nunes said that it was in the intelligence committee's best interests for him to hand over leadership of the probe to Conaway during the ethics panel's inquiry. The allegations that Nunes mishandled classified data were prompted by his unusual press conference describing intelligence documents. The House Intelligence Committee (along with other groups) is looking into Russian meddling in the election. They're also examining possible coordination between the Trump campaign and Russia. And they're asking how classified information about ties between Trump associates and Russia became public — looking into leaks, basically. In early March, President Trump accused former President Barack Obama of "wiretapping" Trump Tower during the campaign. No evidence has ever supported this claim, which has been denounced at the highest levels of the intelligence community. The Russia investigation intersected with the president's claims on March 22, when Nunes gave that press conference and said he had seen classified data showing "incidental collection" of Trump associates during the transition. That's not the same as wiretapping, and would not support Trump's claims, but the president claimed it supported his allegation. The incident cast a cloud over the committee's investigation, and over Nunes in particular. There was widespread criticism from both parties. His sources were challenged: He went to the White House grounds to view the classified information, and some outlets have reported that his sources were White House officials. There was outcry over how he briefed the president and the press, but did not share the data with his colleagues on the committee. There was concern that the presser showed Nunes was too entangled with Trump to properly investigate the Trump campaign. And there were concerns that his public comments about classified data may have been illegal or unethical — in short, may have constituted the same kind of leak Republicans on the House Intelligence Committee had been loudly denouncing. It's those questions that appear to have prompted the ethics review and Nunes' departure from the investigation. A White House spokesman told reporters Thursday that, as far as the Trump administration was concerned, "This is an internal matter for the House."